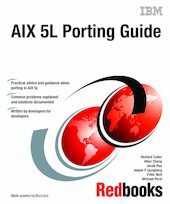 This IBM Redbooks publication details the types of problems most likely to be encountered when porting applications from other UNIX-based platforms to the AIX 5L Operating System. - What programming models are available? - How are threads implemented? - What link options do I need? - Why do my makefiles not work any more? We have tried to condense all of these questions (and answers) into one document, and this book is the result. It has been designed to provide guidance and reference material for system and application programmers who have been given the task of porting applications written in C and/or C++ to the AIX 5L operating system. This book assumes the reader is familiar with the C and/or C++ programming languages and UNIX operating systems.